We do not take any reservations at Pineapple Willy’s. Our wait times vary depending on the size of the party and preference of seating area. To avoid longer wait times, we recommend dining early. Come for an early dinner or a late lunch to avoid a long wait. During peak months of the season, we are typically on a wait from lunch through dinner, so a long wait may not be avoidable. All members of your party must be present before being sat. Of course! We love dogs! As long as your furry friend is well-behaved on a leash, they can join you on our outside dining area! Can I leave with my daiquiri? Yes, and no. If you order a daiquiri that is already mixed, this is considered an “open container”. By law, we are not allowed to let any open containers leave our property without jeopardizing our license. We do offer daiquiris to-go, which can leave the property with you. These are served without the alcohol mixed and with mini bottles of alcohol for you to mix when you get to your destination. Aside from our main parking lot which is a little limited, we have 3 additional parking lots that are a short walk from the restaurant. One is located just west of our main lot between the Circle-K gas station and the Shores of Panama parking garage. The other two are a few blocks east of our main lot and are marked as “Lot 1” and “Lot 2”. How can I book my band to play? Our bands are booked quite a bit in advance. If you would like to submit information about your band, please send it to [email protected]. Are you an allergy-friendly restaurant? What kind of oil do you fry your food with? We use 100% canola oil. We do not use any peanut oil. Do you fry your seafood separate from your chicken? Yes, all seafood is prepared and cooked separately from other food, with the exception of anything that is blackened. If you have any allergies, please make your server aware so that other precautions can be taken to handle your food. Where can I make a To-Go order? All To-Go orders must be placed at the bar and in person. We do not take any To-Go orders over the phone or online. I really want to work at Pineapple Willy’s. How can I apply? All applications must be filled out in person at the restaurant. We do not offer online application or accept emailed resumes. The best time to apply in person is Monday-Friday between 11:00 am and 3:00 pm. Is Pineapple Willy’s open year-round? No. In the Winter, Pineapple Willy’s operation hours and months vary from year to year. While the restaurant is closed in the winter, we are busy with maintenance and updates that are needed to help maintain our building and property. We are literally right on the beach and understand that many people come straight from the sand to dine with us. Bathing suits and flip flops are welcomed – we just ask that you throw on a shirt or top of some kind. 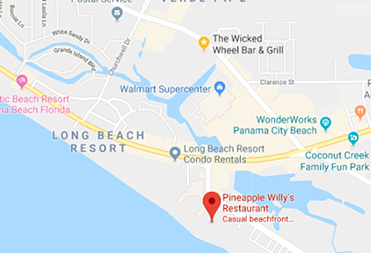 Is there another Pineapple Willy’s? We are the one and only! We have been open since 1984 and continue to serve the best food and drinks on Panama City Beach. How can I exchange a defective t-shirt? For any exchanges or questions for the gift shop, please contact them directly at [email protected].